According to a recent study published in the Journal of the American Medical Association (JAMA), poor physical fitness in childhood is associated with the development of risk factors for cardiovascular disease such as diabetes and high blood pressure. In the study, researchers discovered that young adults who had the lowest fitness levels were three to six times more likely to develop diabetes, high blood pressure, and other problems when compared to youngsters with high fitness levels. The good news is that getting fit helps prevent or reverse many of these health problems and may reduce the risk of diabetes and cardiovascular disease in adulthood. Active children are stronger, do better in school, sleep better and generally grow up to be fit adults. It is a sad commentary of our times that today more than 70 per cent of children between the ages of eight and sixteen do not participate in any kind of rigorous physical activity. The rates of childhood obesity have more than tripled over the past 30 years. If you want to raise an active child, follow these simple steps so that your child is not part of an unhealthy sedentary statistic. Many studies published over the last decade have very clearly shown a direct relationship between the hours that a child spends watching television and childhood obesity. Up to 60 per cent of the cases of childhood obesity is directly linked to too much TV. It has been shown that the rate of obesity rises by 2 per cent for each hour of television watched a day. In contrast, children who reduce their television viewing gain less weight. It has been estimated that an average child spends about 24 hours a week in front of the TV. So, limiting the amount of time your child spends watching TV will free up a lot more time for useful and healthy physical activities. Research has shown that children of parents who both exercise are about five times more likely to be active than children whose parents lead a sedentary lifestyle. Another study has demonstrated that if both parents are obese, your child has an 80-per cent chance of being obese, compared with a 50- per cent chance if only one parent is obese and a 10-per cent chance if neither parent is obese. Exercises involving the whole family is a good idea and also has an added spin-off of giving you good quality family time together. It is prudent though to consult your family doctor or a sports physician before you begin an exercise program, particularly if you haven’t been active for some time. This rule holds true for your child too. All of us remember our toddlers as livewire bundles of energy. It should be our endeavour to direct this energy into a sustained lifelong love of physical activity. For starters, you can begin by having your child show you how rabbits hop, eagles fly or dogs wag their tails, and grade them. Way to set the foundation for good fitness habits is to incorporate physical activity into your child’s life at an early age. It helps if your toddlers can see for themselves how much fun being active can be. Participating in organized sports today involves a lot of commitment from the child as well as the parent. 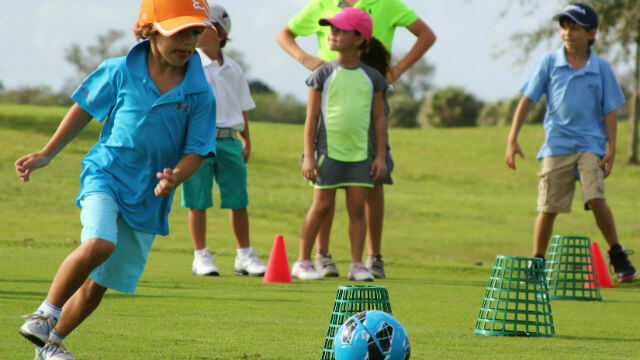 A lot of factors have to be considered while enrolling your child for a sport. Some of them is the commitment of time, the incidental costs including playing kits, travel costs, and your child’s physical and mental maturity to take to the sport. Enrolling your child in sports classes like cricket, tennis and squash camps are not the only means to ensure that your child is physically active. We must realize that children have different characteristics and strengths, which may help them in certain activities rather than the others. The challenge lies in finding what your child likes to do. The best option is usually to promote ‘activity’ instead of structured exercise or games. Encouraging free play activities like hide and seek, cops and robbers, playing tag and skipping, for example, may be the best way to get your child moving as well as kindle your child’s enthusiasm towards physical activity. There is a direct relationship between the amount of time spent in physical education classes at school and activity levels among students. Schools and parents should work together to increase the number and hours of physical education classes and to encourage more activity among students. If you’re concerned about the lack of physical education opportunities in your child’s school, work with your school to improve the situation. Finally, we must all remember that the benefits of getting your child to incorporate physical activity as part of their lifestyle will have a ripple effect on future generations and contribute to the overall enhancement of public health. ← How To Diagnose & Treat Appendicitis The Right Way?